Okay, so you are dedicated to becoming free from all the fuss and bother that go into hair removal. You are ready to throw away the blades, the creams, the bleaches, the waxes and the tweezers and be hair free. Where should you start? With your electrologist, of course. Because even if you decide to go with Laser Hair Removal, you deserve to be in the hands of a professional who understands the cycles of hair growth and the factors that influence it. While many laser hair removal clinics and spas are overseen by doctors, it is often not the doctor who will see and treat you. When you seek out a certified electrologist you can be assured that you are seeing a professional who can advise you on a treatment plan and schedule that will give you the results you want. You'll have the confidence of knowing the advice is based on a minimum of 500 hours of training, years of experience and an in-depth knowledge of the locally available options in hair removal. Some of our members are trained in both Laser Hair Removal and Electrolysis, but even those who don't will be able to advise you on the choices available in your area and recommend services that have a high satisfaction and approval rating. If permanent hair removal is your goal, then chances are you are going to end up seeing an electrologist for the final steps of treatment anyway. 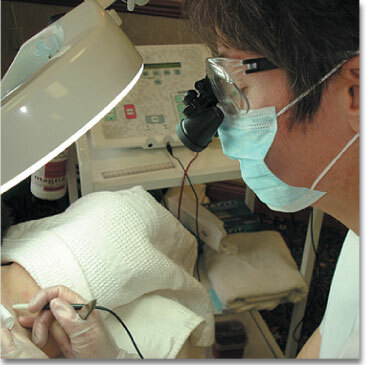 By starting there, you can ensure that your treatment and care is top-of-the-line from start to finish. Book an appointment with one of our members by searching our Members Directory for your area. In part V, we'll get into Follow Up Visits.